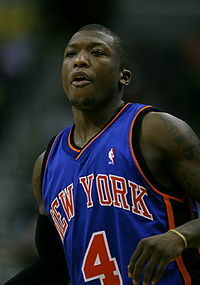 New York Knicks guard Nate Robinson has been fined $25,000 by the NBA for remarks made by his agent. The penalty was issued Monday. Robinson has been benched for 12 straight games by coach Mike D’Antoni. Agent Aaron Goodwin recently told reporters he’d asked the Knicks to move Robinson to another team. The NBA also fined former Golden State Warrior Stephen Jackson for publicly demanding a trade. I hold to the same view on Robinson that I took in regards to Jackson. If the Knicks can’t trade Robinson, they should swallow his salary and cut him loose. In any case, he is of no use to the team as long as he is benched by D’Antoni.